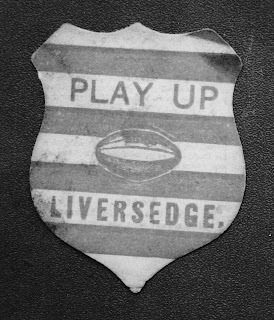 After a difficult first season as members of the Northern Union the 1896/97 season, their second in the new breakaway competition was one of consolidation for Liversedge Football Club. At the end of the 1895/96 season the Northern Union had decided to spit into Lancashire and Yorkshire sections, a change that would help clubs with the cost of travel, which was an issue for small organisations like Liversedge. On the field the club was a little more consistent, finishing in 11th place in a league of 16 clubs. There were also some notable victories, including a10 points to 0 away win at Huddersfield and a 23 points to 7 home victory against Wakefield Trinity. The club also had the advantage, in the 1896/97 season, of local derbies against near neighbours Heckmondwike. The home game against Heckmondwike, on 16th January 1897, produced one of the best gates of the season, with receipts of £29 6s and 10d. However, it wasn’t the league games that produced the best gates in 1896/97; it was the Rugby League Challenge Cup. On 27th March 1897, Liversedge were at home, in the first round, against their local rivals Heckmondwike and won the cup-tie by 9 points to 4. Better still was a half share of the gate receipts which amounted to £37 15s 10d. In the next round of the Challenge Cup Liversedge had to travel to Warrington on Saturday 3rd April. Unfortunately it wasn’t a successful visit on the field, as Liversedge lost by 6 points to 0, but off the field it was a different story - a half share of the gate amounting to £40 8s 2d, easily the best of the season. During the close season the club had undertaken some fund raising, so that when Mr J.E. Hampshire, the financial secretary, presented his balance sheet it showed that £50 9s 3d was owed to the bank. This balance was regarded as quite acceptable by the President, Mr Herbert Heaton JP. He felt that as long as every player and member continued to work hard, then the club could look forward to reducing its liabilities. He also said that the sum owed was very small for a club like Liversedge. The large attendance of members at the Annual General Meeting on 28th June 1897 must have left the Liversedge club rooms encouraged by what they had heard and looking forward to September and the start of the new season.